IVECO has brought its Natural Power range of commercial vehicles to Argentina, a major development for the country which until recently has held firmly to vehicle conversions as the way to access alternative fuels. The introduction of natural gas powered OEM vehicles will support the nation’s growing commitment and investment for sustainable, cleaner alternatives. 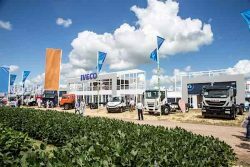 IVECO Argentina showcased a range of Compressed Natural Gas (CNG) powered vehicles at Expoagro in the city of San Nicolás within the framework of its 50 years of manufacturing at the Industrial de Ferreyra en Córdoba (Ferreyra Industrial Park). Included were the IVECO Stralis and Daily Blue Power. Notice was also given of intention to manufacture locally a CNG version of the Tector 160E21, a medium-sized truck that has been a workhorse of Argentine industry, in the last quarter of 2019. This latest generation of the Natural Power range has the highest technology, design and equipment equivalent to its diesel pair, while cutting comparative fuel costs by about one third. “The introduction of the Natural Power range to the Argentine market responds mainly to a change in the energy matrix in the country’s commercial vehicles, but also to offer our carriers a more profitable solution in their operation. On the other hand, it is a sign of the brand’s interest in reducing the carbon footprint in the environment,” said Sebastián Rodríguez Macías, Commercial Director of IVECO Argentina. “With a 15% reduction in nitrogen monoxide (NOx) emissions and 76% fewer particles, compared to diesel fuel, IVECO vehicles maintain the power and robustness that characterizes them. IVECO’s CNG fleet in Europe exceeds 30,000 vehicles, which carry out their work in both urban and long-distance transport. We want to start the path for Argentina to move towards a more sustainable and environmentally friendly transport,” he concluded. The vehicle, conceived to work with CNG technology, has a longer engine life and longer maintenance intervals due to its cleaner burning operation. “Our vision is to continue on the path to be able to, in the not too distant future, offer the full line of our clean energy powered vehicles. We are very proud to bring high technology to this country. From the firm we have more than 20 years experience in the European market, achieving global recognition after receiving multiple awards”, said Francisco Spasaro, Marketing Manager of IVECO Argentina. IVECO Argentina is traveling the road in its 50 years of uninterrupted production in Argentina. With more than 100,000 units produced and an extensive portfolio with the latest technology, highly trained personnel and meeting the quality standards required by the demanding markets, the IVECO Argentina plant in Ferreyra, Cordoba is an example of an automotive industrial process in Argentina. IVECO Argentina has a network of dealers throughout the country thinking about the needs of customers and maintaining an accompaniment in the after-sales service. Currently, the IVECO plant is part of a unique structure in the world: the industrial pole of the CNH Industrial group, which houses, in addition to the truck factory, the agricultural machinery and construction plants of the brands Case IH, Case Construction, New Holland Agriculture and New Holland Construction, and the engine plant of FPT Industrial. This is a sample of the synergy with which the brands of one of the most important global capital goods manufacturers and the most relevant in Argentina work. IVECO is a brand of CNH Industrial NV.